InDesign is still becoming the main option when it comes to desktop publishing tool. The problem is that the tool is only available for Windows and macOS. Linux users will commonly use Scribus as an alternative to InDesign, but we have to admit that Scribus can’t completely replace InDesign. There is another alternative if you are a Linux user and is looking for an InDesign-like tool. The tool is Lucidpress. It is a web-based publishing tool so whatever your platform, you will be able to use it via web browser. One thing you will be liking, especially if you are an InDesign user and is planning to make a switch. Lucidpress has a compatibility with InDesign. You can import your InDesign files to it and edit them as well. Let’s dig further to get to know it better. What the tool can do? The very first thing you need to notice when you are looking for a publishing tool to replace InDesign is the capabilities of the tool itself. As you knew, you can create nearly everything with InDesign. From flyers, posters, magazine layouts, invitations and so on. The question, is Lucidpress capable of creating the same stuffs? Lucidpress is not the only online tool out there with the capabilities of creating stuffs like mentioned. There are also other tools like Piktochart, Canva to Crello. But, I can say that Lucidpress is the best one if you really plan to use it to replace InDesign. The tool looks very professional. You can use the tool to create nearly all types of design you usually create with InDesign. From brochures, flyers, magazine layouts, posters and lots more. In addition, it is also capable creating visual contents for social media. One more interesting part about Lucidpress is that you can share your designs — as well as folders — with someone, allowing you to work collaboratively with your team. The concept is pretty similar to Google Drive whereby you can set the permissions before starting to share. If you ever used online design tools like Canva and Crello, you will find a fact that they tend to have the similar interfaces. Commonly, they have a main menu lies at the left-most side of the screen with a design element selector right next to it. Lucidpress uses a different approach. Despite the tool is web-based, you will see a desktop-taste interface. There is also menus at the left-most panel, but it only takes a few portion of the screen. The main menus are located at the top bar just like most desktop-based apps. The sidebar menus tend to be used to select elements you want to add to your design. The working canvas is located at the middle of the screen. 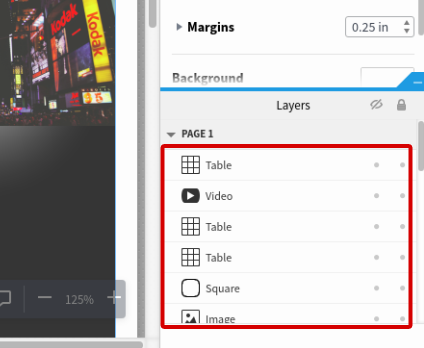 While the left panel is used to select design elements, you can use the right panel to format the page. A formatting toolbar will appear every time you click certain texts with the aim to edit them. The nice thing about Lucidpress is that it shows all of the layers of the design template you chose, enabling you to learn the element structures of the concerned template. Layers are important enough in the editing process. What makes your design looks different and stand out than other designs are the elements you add to your design. Just like other similar tools, Lucidpress also allows you to add the elements you need to accomplish the design concept you set in advance. At this part, the way Lucidpress works is a bit different. Tools like Canva and Crello provide an abundant collections of elements you can add to your design, be it free or paid ones. Some of the elements you can add with those tools are shapes, symbols, lines and so on. They also provides thousands of photos. Lucidpress works different way. Instead of providing free photos and other elements, it lets you to use your own photos and elements. In some cases, this concept is better since selecting an option out of thousands can cause a headache. On the other hand, you need to prepare everything in advance before getting started to designing. This include preparing symbols, photos and shapes which can take some times if don’t you have one in your computer. Lucidpress comes with an image manager to allow you upload images for repetitive use. You can also import your images from Google Drive. Other elements you can add to your design amongst other are videos, buttons and tables. Giving users too many options seems is not a Lucidpress style. The tool doesn’t offer too many options of templates, at least compared to Canva which offers thousands of design templates. The good part about Lucidpress is that the templates are well-arranged in some specific uses. For instance, if you are looking to create a printed flyer, you can find the templates in the “For Print” category. Or, if you are looking to create a visual content for social media post, you can discover the suitable templates in the “Social Media” category. Want to create a design from a blank page? Lucidpress also makes it possible. It’s right that the templates offered by Lucidpress tend to limited (if you take Canva as the comparison), but they look very professional. 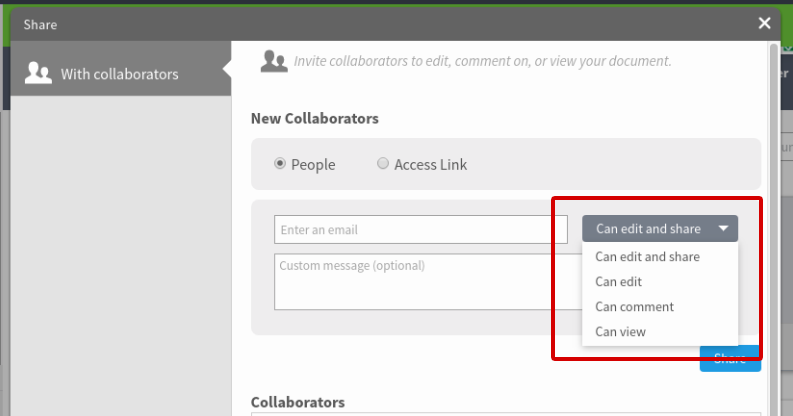 Collaboration is becoming a new standard adopted by most online tools these days. Lucidpress also comes with that type of capability. While tools like Piktochart requires you to upgrade your account to use this feature, Lucidpress doesn’t apply the same requirement. Regardless the plan you are registered to, you can work collaboratively with your team by sharing the design you are working on. You can even share the folders. The collaboration concept of Lucidpress is quite similar to Google Drive (and other cloud storage services generally). You can share certain document via either email or link. Before pressing the Share button, you can apply the permission of the document (or folder) you are going to share. Sharing a document (or folder) in Lucidpress is easy. You can find the Share icon every time you hover your mouse over certain document or folder. Document manager is crucial enough feature especially if yo regularly create new designs in your daily basis. 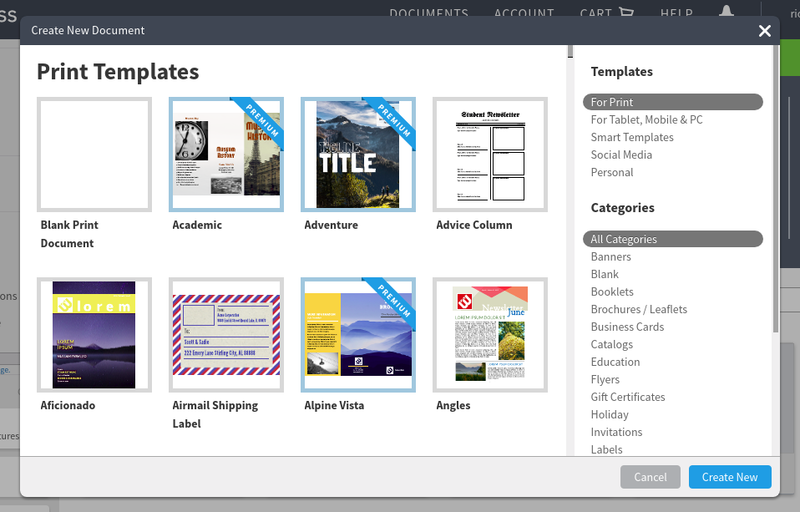 The feature enables you to organize your designs by putting together designs with the same topics in the same folder. Tools like Piktochart only provides this feature for premium users. Thankfully, Lucidpress doesn’t apply the same rule. Free users even allowed to create as many folders as they want. 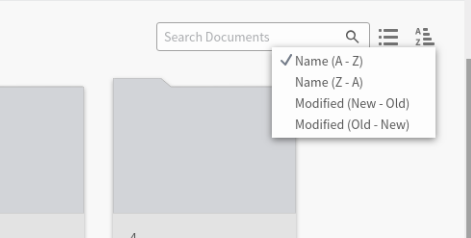 The document manager feature of Lucidpress also features a handy search box to makes it easy for you to find certain design in case you want to create a new one with the similar layout. You can also sort the documents by name and modification date. Simply put, the document manager feature of Lucidpress is great. Probably the best one compared to other document manager of other tools. The business model adopted by Lucidpress is the same as the vast majority of online tools, freemium. One of the biggest differences between free version and paid version of Lucidpress is the number of page you can add per document. Free accounts are only allowed to add the maximum of 3 pages per document, which can be a serious problem if you are looking to use Lucidpress to design a magazine. Other difference is the storage space amount, which you will use to store image libraries and designs as well. Free account will only get a 25MB of storage space. Very limited and be a critical issue since Lucidpress doesn’t offer free image at all. You can cheat this by connecting your Google Drive account to Lucidpress. The good news from the free version of Lucidpress is that you can download the finished design without needing to deal with annoying watermark. When downloading the design, free accounts have no chance to select the image quality, while the premium users will be able to select image quality by dpi. Two other features that are only available for premium version are document analytics and backup manager. As I said earlier, Lucidpress is great to replace InDesign since it has a compatibility with it. 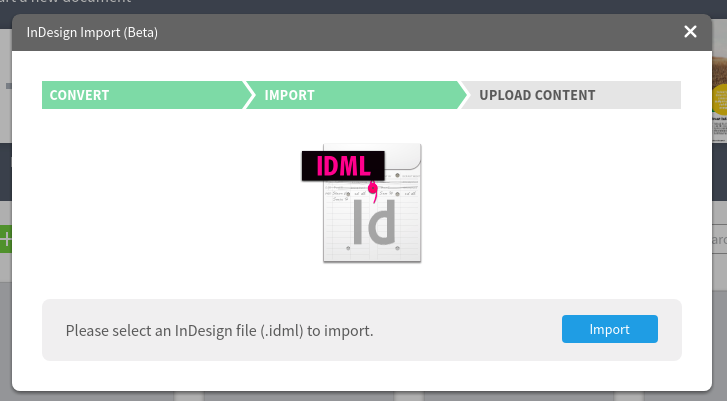 Which means, you can import your InDesign files with the aim to edit them. Lucidpress has a limited font collections, but you don’t to worry about this. If Lucidpress can’t find the fonts used on the InDesign file you have imported, it will ask you to upload the fonts so you won’t lose any detail part of your design. We have covered how to import an InDesign file to Lucidpress is this article. Lucidpress is obviously not the only online tool you can use to create flyers, brochures, magazine layouts and so on. But, if you really need a tool to replace InDesign, I can say that there is no online tool better than Lucidpress. Even Canva which is often considered as the best tool in this segment. Regardless of its lack of templates and design elements, Lucidpress comes with a desktop app approach on its interface, making it great to replace InDesign and other desktop publishing tools. Lucidpress also comes with a nice brand management tool. 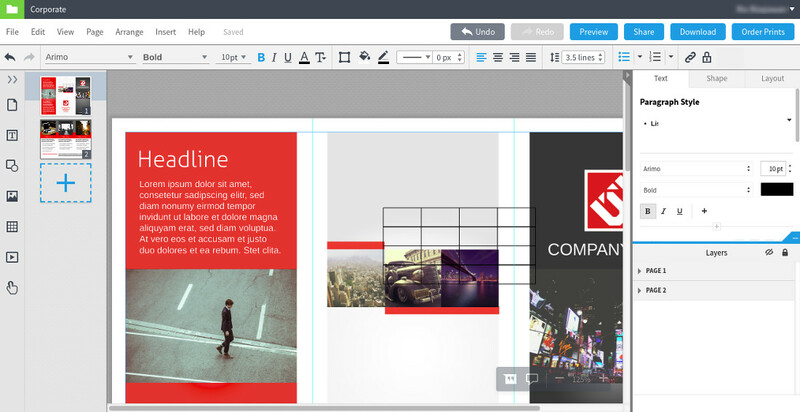 If you need a publishing tool with the approach of desktop app then Lucidpress is great. Its interface and the way it works is really close to desktop publishing tool. Conversely, if you prefer similar online tools that offer more free templates and design elements then you should look for another alternative.